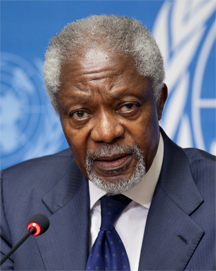 On January 1, 1997, Kofi Annan of Ghana became the first United Nations staffer to rise to the position of Secretary General — a most significant promotion in line. Photo by the US Mission in Geneva, courtesy Wikimedia Commmons. Promotions in line typically entail accepting responsibility for supervising people in positions like the one you hold now. Promotions in line, like other promotions, aren't about reward or recognition — they satisfy employer needs. When employers promote people in line, they're trying to fill positions with the right people, at the right time, for the right price. People promoted in line usually know the organization well. They've established valuable relationships and they know what's needed and what's expected. Most organizations do require that the position be open to any employee, and complying with that policy does take some time. But hiring from within or promoting someone in line is usually faster than hiring from outside. Promoting in line saves money. A shorter and simpler search process, a shallower learning curve, and zero recruiting fees make such moves attractive to employers. But most important, we can often avoid the premium compensation that might be needed to attract highly qualified people from elsewhere. Here are some tactics that help you land a promotion in line. Do your current job well, but seize opportunities to demonstrate that you can handle the responsibilities of the job you seek. Don't pursue such opportunities too aggressively, but grab them when they come by. If you're critical to organizational success in your current position, you're difficult to replace. Not so good if you want to be promoted. Share what you know. Be ready to leave your old job behind, and be ready to move into the new job. Promotion in line can sour relationships with those of your current peers who would be reporting to you. Making the people you work with now look good helps them, helps the organization, and dampens many of their concerns about your promotion. And it makes your about-to-be-peers comfortable, too. Be willing to relocate and travel. Balance your own needs with the needs of the company, and keep in mind that the balance you choose affects both your chances for promotion and your personal life. Enter in your working journal contributions you make that bear on your target position. You probably won't be conveying this information to anyone else, but the writing motivates you to look for — and do — things you can write about. For more on promotions, see "How to Get a Promotion: the Inside Stuff," Point Lookout for August 16, 2006, and "How to Get Promoted in Place," Point Lookout for August 23, 2006. Would you like to see your comments posted here? rbrenTllqmgdgQYbNBmBaner@ChacJAXjrxvvdWwPYyNSoCanyon.comSend me your comments by email, or by Web form. I offer email and telephone coaching at both corporate and individual rates. Contact Rick for details at rbrenpLxLpPujSUYyNgoyner@ChacftSKfTxZgxsBWFKEoCanyon.com or (650) 787-6475, or toll-free in the continental US at (866) 378-5470.